As project owner, you can assign administrators to the projects hosted on your POEditor account, in order to have them handle the software localization management. You can add administrators to a localization project in Project Settings. To add an admin, in the Access to Project section, press the Add Administrator button. You can choose to add as admin a user that's already assigned to your project, or a new one. The number of admins you can have per localization project is not limited in any way. 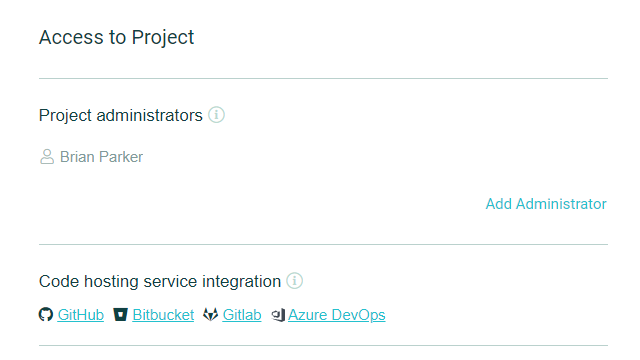 accessing the GitHub, Bitbucket, GitLab and VSTS integration pages. Note: Administrators are assigned on a project level, not on an account level, so they can't manage your account's billing. If you want someone to handle the payments for the software localization services you use, consider setting a payer on your account.